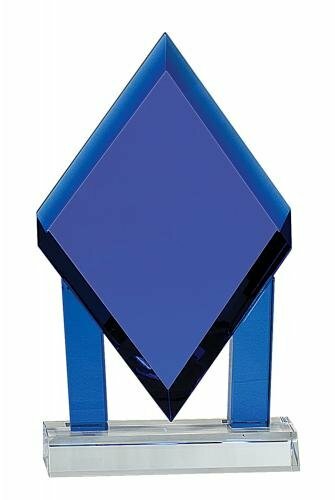 This clear optic crystal award is bordered on both sides by sapphire blue columns. Both the clear and the blue crystal are beveled along both edges, showing more dimension where the pieces are joined. 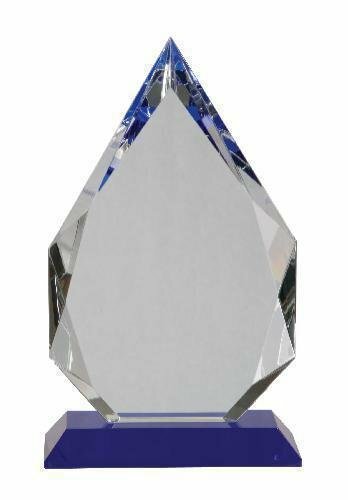 Mounted on a clear crystal base with a large area for personalization and packaged in a velvet lined gift box, this elegant crystal is the perfect way to recognize excellence in achievement. This ¾” thick clear optic crystal is framed on one side and along the bottom by sapphire blue crystal. The clear crystal is beveled both front and back, so the blue can go on either side. 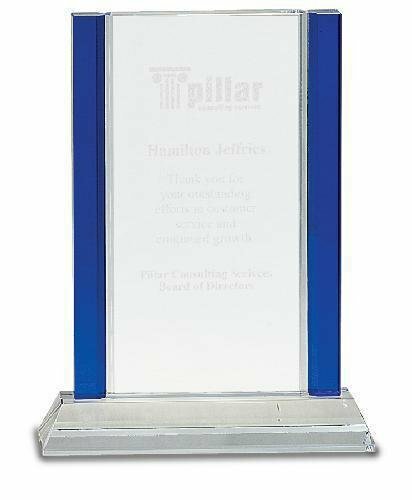 Personalize the large engraving area of this stunning design to recognize and honor the top achievers and milestone events of your organization. This premier crystal is packaged in a velvet-lined presentation box. 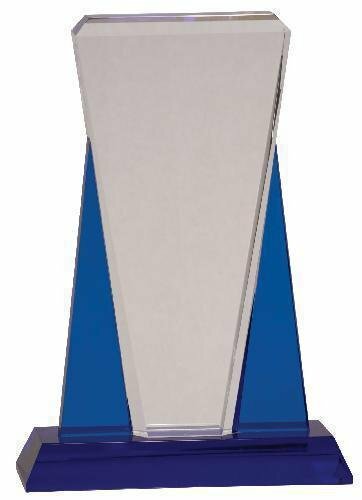 This elegant award stands 9.25" tall and features a swooping crest top cut and side blue accent. Includes up to 100 words or 80 words plus logo and velour-lined presentation box. 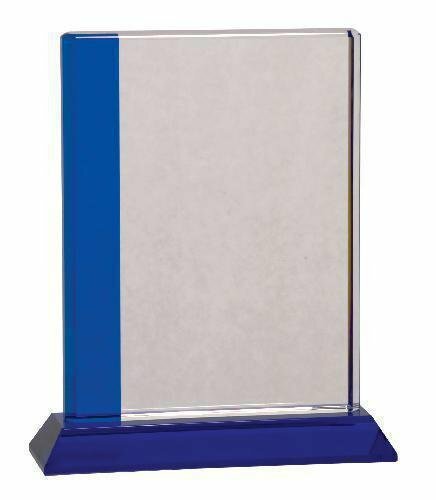 This ¾” thick clear optic crystal is framed on one side with a blue edge and the other side a curved edge, providing a unique display. 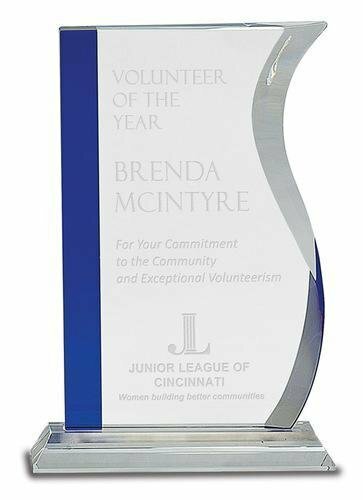 Personalize the large engraving area of this stunning design to recognize and honor the top achievers and milestone events of your organization. This premier crystal is packaged in a velvet-lined presentation box. Sapphire blue crystal columns and base frame the crystal wedge engraving area on the bottom and two sides. 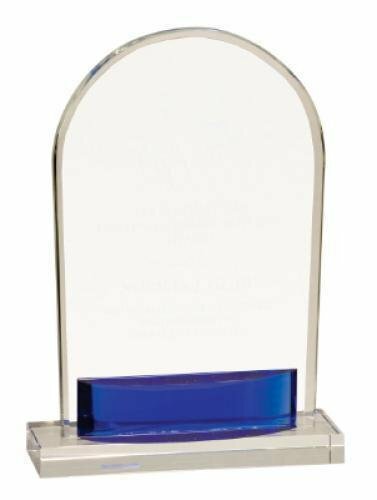 Packaged in a velvet lined gift box, this exquisite piece has plenty of room to personalize to recognize and honor the top performers in your organization. 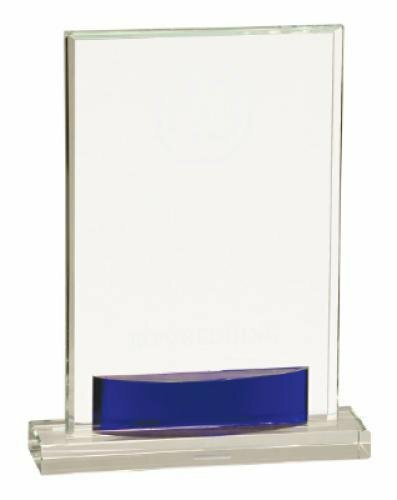 This elegant award stands 8.75" tall and features a blue crystal face supported by blue columns on a clear base. Includes up to 100 words or 80 words plus logo engraved on face, resulting in a high-contrast white frosted appearance. Also includes a velour-lined presentation box. 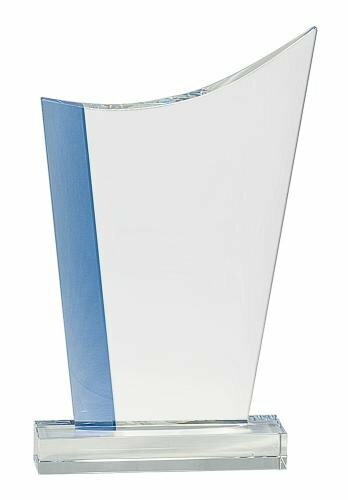 This clear crystal arch is front beveled and mounted on a clear crystal base. The blue crystal accent is a half circle ¾” deep in the center that adds a splash of color and reflects up through the clear crystal. The large personalization area provides plenty of room for personalized text. This premier crystal is packaged in a velvet-lined presentation box. This clear crystal piece is front beveled and mounted on a clear crystal base. The blue crystal accent is a half circle ¾” deep in the center that adds a splash of color and reflects up through the clear crystal. The large personalization area provides plenty of room for personalized text. This premier crystal is packaged in a velvet-lined presentation box. 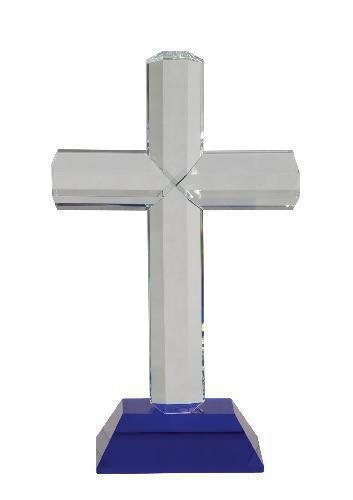 Measuring 8.5" tall, this crystal cross on a blue crystal base beautifully reflects light while honoring its recipient. Up to 60 characters of lettering included on plate mounted to base. Sturdy presentation box also included. Deep bevels and large cut facets grab and reflect light throughout this stunning piece. Mounted on a blue crystal base, this sparkling diamond can be personalized for the ultimate in recognition of excellence. This premier award is packaged in a velvet-lined gift box.